Inside Out and Back Again meets One Crazy Summer and Brown Girl Dreaming in this novel-in-verse about fitting in and standing up for what’s right. It's 1969, and the Apollo 11 mission is getting ready to go to the moon. But for half-black, half-Japanese Mimi, moving to a predominantly white Vermont town is enough to make her feel alien. Suddenly, Mimi's appearance is all anyone notices. She struggles to fit in with her classmates, even as she fights for her right to stand out by entering science competitions and joining Shop Class instead of Home Ec. And even though teachers and neighbors balk at her mixed-race family and her refusals to conform, Mimi’s dreams of becoming an astronaut never fade—no matter how many times she’s told no. Winner of the 2015-2016 APALA Literature Award in the Children's category! 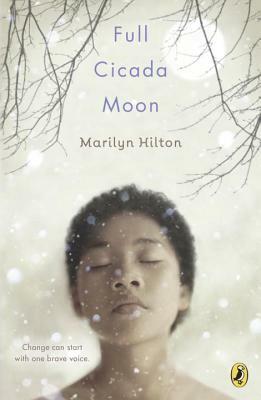 Marilyn Hilton (www.marilynhilton.com) has published numerous short stories, poems, essays, and two previous children's books. She lives with her husband and three children in Northern California.